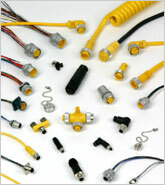 Mencom Corporation manufactures many different types of industrial electrical connectors. 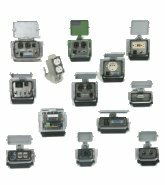 Their quick disconnect molded cable is a popular style connector that is available in several sizes and configurations. Featuring 2 to 19 poles, wire size 18AWG to 14AWG, straight or right-angle connectors, molded yellow cable with IP67 protection, and a host of accessories. A panel interface connector (PIC) is a device that is mounted to the outside (exterior) of a panel that houses a PLC or computer. The PIC allows the user to interface the PLC or computer without opening the panel door, thereby, eliminating the potential safety hazards associated with having an open electrical panel. The standard PIC contains one or more of the connectors that are commonly used to interface a PLC, computer or other devices that are commonly housed inside the cabinet. 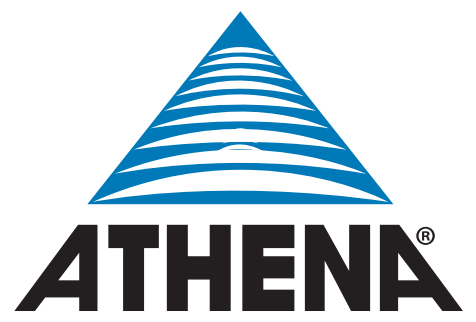 The connectors include, but are not limited to, D-subminiature connectors (9, 15, 25, 37 or high density 15 pin), RJ45, RJ11, DIN, BNC and coaxial connectors. Any of these connectors are available alone in a PIC, with a power outlet, or with another connector. 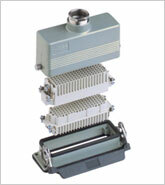 Also available from Mencom is the ILME line of heavy duty power connectors. 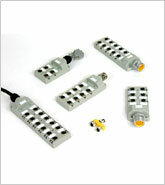 Featuring standard size inserts available in many configurations, these rectangular connectors provide a low-cost alternative for aggressive or high-temperature environments. 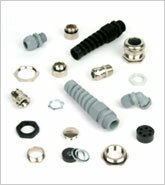 Inserts can have up to 209 crimp terminals or up to 65 screw-clamp or spring-clamp terminals. Inserts can include both low-current and high-current (80A) terminals, and even pneumatic junctions for pressures up to 8bar. These inserts are enclosed in an epoxy coated die-cast aluminum alloy housing with gasketing and stainless steel latches that provides IP65 protection and fuel- and oil-resistance. 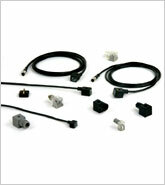 Mencom’s lines of solenoid valve connectors are used in a wide variety of manufacturing situations.